The Junior Auxiliary of Laurel will be celebrating National JA week, April 7-13th. 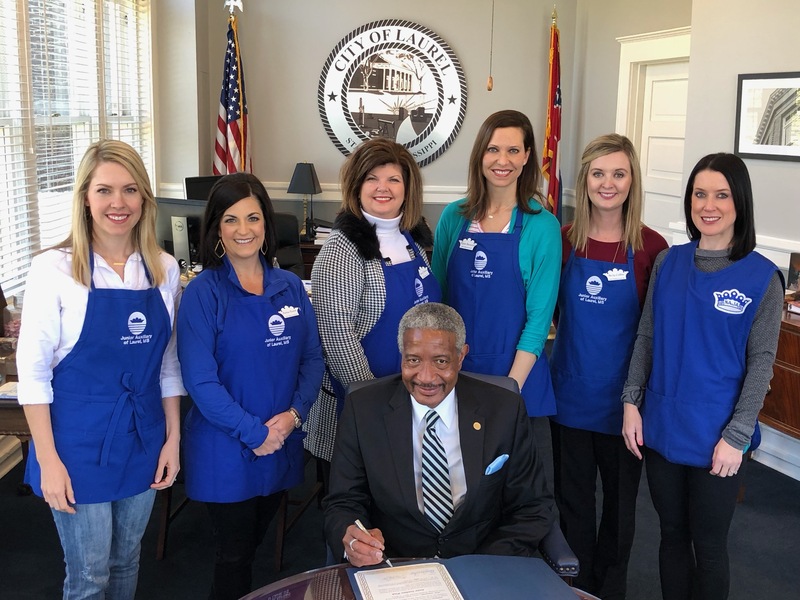 On April 1st, Mayor Johnny Magee signed an honorary proclamation designating the week as Junior Auxiliary week in Laurel, Mississippi. This annual celebration is a time to pause and thank the community, sponsors, and volunteer members who work so hard year-round to make a positive difference in the lives of children in Laurel and Jones County. The Junior Auxiliary of Laurel began in 1932 with 23 Charter members and currently has 60 active members who donate over 3,500 of hours annually to the chapter’s various projects. These service projects include Amblyopia screening, Child Abuse Awareness, Secret Meals, Family Matters, Girl Talk, Parkside Playground, Salvation Army, Scholarship, Very Special Arts Festival, Done in a Day, Lady Tornado Chick Chat, Huddle Up, and an annual Provisional Project. The chapter raises funds each year through Shareholders, Patrons, Frosty Frolic 5K, and An Evening with Junior Auxiliary Gala. “This is an exciting week for us, because it gives us a chance to thank all of the citizens of Jones County for supporting us in this work, and to recognize our wonderful corporate sponsors who finance these projects”, says JA of Laurel PR chair Bryn Nasajpour. “The families and children we serve are so deserving and thankful for this assistance, and none of that would be possible without the support of the entire community.” The Junior Auxiliary of Laurel is a part of the National Association of Junior Auxiliaries (NAJA), a non-profit organization founded in 1941 with headquarters in Greenville, MS. NAJA has 15,043 active, associate, and life members in 96 Chapters in Alabama, Arkansas, Florida, Louisiana, Mississippi, Missouri, and Tennessee. Junior Auxiliary members (worked or volunteered) 96,312 hours in their communities, and invested $2,890,818 in seven southeastern states in 2015-2016. The NAJA slogan is “Care Today- Character Tomorrow.” Junior Auxiliary chapters are working more than ever to provide care to those less fortunate in order to make their tomorrows better.